Need A Quick Cash Loan Today? No individual should have to experience the stress of an ill-timed bill that’s due a week before payday. No business owner should have to choose between purchasing necessary inventory and satisfying payroll obligations when incoming cash flow is low. Whether you’re an individual or a business owner, there may come a time in which you need a little extra cash to pay an unexpected debt or keep your company growing. If that time is now, a Singapore licensed money lender can help. Query for Fast Cash Loan Now! When you need cash on short notice to pay a bill or keep your business operating, it’s temping to simply borrow or get funds from the first company willing to offer you a loan. That could be a mistake — especially in today’s competitive lending market. Many money lenders will offer loans to most applicants — even those with less than perfect credit. When you begin to research different moneylenders, though, you’ll find that their interest rates and repayment terms can differ greatly. You may even find some moneylenders operating without a license from the government. When you look for a loan provider, examine the transparency that the different organisations provide into the application process. At Credit Excel Capital, we work every day and respond to loan applications within few minutes. If you have a question, you can reach us by phone or email. You can even visit our office. If you investigate all of your loan options, we are confident that you won’t find a money lender in Singapore with greater flexibility, transparency and convenience than Credit Excel Capital. Complete the form now to apply for your loan. You’ll receive a response in about 5 minutes. Singapore Reputable and Best Licensed Money Lender Since 2010.
Credit Excel Capital is recognised and licensed by the Registry of Moneylenders Singapore (Ministry of Law), Credit Excel Capital is considered as one of the reputable money lender in Singapore. We offer a selection of personal financial services such as personal loan and payday loan with low interest rate that will meet your needs or economic situation. Read more about us. Why Choose Credit Excel Capital? When You Are Looking For A Best Licensed Moneylender In Singapore? Our mission is to adhere to the sternest code of ethics and principles in dealing with our customers as well as our business protocols. We desire to be a value added company that support and ensure that our customers can place their 100% trust in us to serve and provide their needs. As the leading Legal Licensed Money lender in Singapore, we portray and safeguard professionalism and handle every single customer in an absolutely fair and square manner. Credit Excel Capital is professional and fully licensed Money Lender company that are authorised by the Registry of Money Lender Singapore. Branded as one of the top premium leading licensed moneylender, Credit Excel Capital pledge to uphold and provide professional services and extensive credit loan products that are specially tailor made to suit our customer needs. At Credit Excel Capital, we showcase a wide range of flexible loan services available that specially cater to your needs such as Personal Loan, PayDay Loan, Short Term Loan, and Foreigner Loan and even Business Loan. 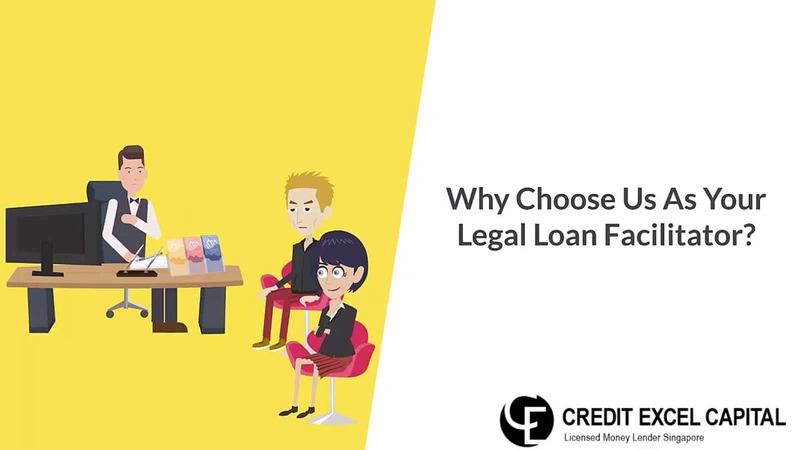 Why Credit Excel Capital Licensed Money Lender Is Your 1st Choice? Credit Excel Capital is formed by a group of experienced and professionally trained financial advisors in the industry ever since year 2010. Over the years, we have been helping many to solve their financial problems. That explains why Credit Excel Capital will always be Singaporeans first choice whenever they search for licensed money lender. We strictly adhere to all the rules and regulations set by MinLaw – Ministry of Moneylenders. Thus, these are the reasons that led us to where we are today. Credit Excel Capital understands that working in Singapore is not easy and thus we would like to extend our helping hands to those foreigners who are working hard and barely meeting ends meet. As such, we would like to extend a helping hand to aid them and get through tough times. Our primary goal is to serve and provide great assistance to our valuable customers. Our procedures are very simple, quick and hassle free. The best thing is that you do not need to wait for months for your loan approval. We are always listening and just 8 digits away. Our friendly staffs are ever ready to aid your needs whenever and we are a legal moneylender in Singapore that will response to your loan applications even on a Sunday. At Credit Excel Capital, we have established strong foundation and form trust with our valuable customers. We promise that any information that you have provided us will be strictly confidential. No disclosure of any information without any consent and there is absolutely no reason to do so. Thus, you do not to worry and just give us your 100% trust. We will do the hard work and personalised the best loans services in the Singapore markets that cater to your needs. Over the years, we have been consistently and diligently working on our customer relations service team and gathered precious informative feedbacks from our valuable trustees as to how our company can improve on in order to make it a more pleasant and healthier environment. We are committed to provide immense satisfactory and the finest quality products, as well as to deliver elite customers services that will make you feel like there is no other place like home. Credit Excel Capital desires to serve you better as we aim to be the finest Money Lender in Singapore that listen well to your needs. For any loan enquiry, just leave your number here, our loan officer will give you a call back in 5 mins! Types of Loan We Served! If you are in need of cash to settle any specific expenses or bills, taking out a personal loan is the most practical option you have. After all, borrowing money from family members or friends may impact your relationship with them. To avoid any inconveniences or hassles, you are better off looking for a reliable money lender in Singapore that offers the best rates for personal loans. You will also be assured of total confidentiality once you release important information to us. So, consider getting an unsecured personal loan from us that can help you surface from your financial troubles. There may be an instance when you may come across some financial concerns even before you receive your paycheck. If this is the kind of situation you are in, then Credit Excel Capital may be able to help you. We offer payday loans that will take you until the next paycheck, so you can have enough cash to pay off your bills or settle emergency expenses. Our seamless and straightforward process for loan application will spare you from any hassles along the way. There are also flexible repayment plans that suits your specific needs. Are you in need of cash to pay your rent, bills or monthly expenses? It may not be easy to get a legal loan for Foreigners and S-Pass holders who are residing in Singapore. Especially for those who have never taken a loan before, it can be risky to borrow from the wrong company. But at quickmoney.sg, we provide legal loans and are licensed by the government to help you get through any financial difficulties quickly and easily. Simply arrange a meeting with us with the necessary documents to take a loan! Are you looking to expand your business or settle some existing expenses, yet there is a shortage on funds? If so, then taking out a business loan applies to your particular situation. Credit Excel Capital caters to either SME or MNC in different types of industries in Singapore. By applying for a loan from us, you no longer need to go through the long wait until your application is approved. We will provide you with the extra cash you need to facilitate the undisrupted and regular operations of your business. This is my first time borrowing money from a licensed money lender, dropped by their office and was welcomed by warm and friendly consultants, the transaction was done so easily! No doubt they one of the reputable moneylender in singapore, service is tip top and explanation is very clear. happy with the loan issue speed and it didn’t take them long to disperse the cash. Many variety of loan packages offered for me to choose from, and they are flexible with the repayment schemes. Will definitely recommend to my friends in future. Query for Personal Loan Now! As a licensed and best money lender in Singapore, Credit Excel Capital aims to provide all clients with a fastest and most reliable service to fulfill their needs. In fact, we do not take our clients to a long and tedious process just to get their loan applications approved. We value our customers, so we make it a point to facilitate loan transactions in a convenient and efficient way. Moreover, we give flexible repayment schemes for our clients, which will suit their specific concerns. You may opt for a fixed amount for the monthly payment or flexible remuneration dates. Most importantly, we place high regard to all out customers. With this in mind, all pieces of information provided to us are kept in strict confidentiality. Hence, we remain as one of Singapore’s most dependable and highly professional licensed moneylender for all your financial situations. If your concern is to look for a reliable money lender in Singapore. Credit Excel Capital will be your best choice! Check out our various repayment schemes and the best interest rates for your personal loan today! Credit Excel Capital Pte. Ltd.